Today's post is really just an excuse to share my latest fan conspiracy theories. But since I'm pretty sure that a bunch of you are down for that, I figure it's okay. 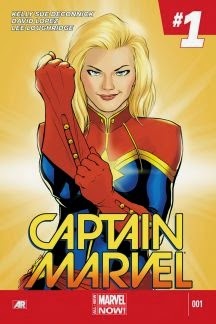 And besides, Carol Danvers, aka Captain Marvel is a pretty rad Strong Female Character. She's one of the leading ladies of the Marvel Comics, and they just relaunched her solo comic (the aptly named Captain Marvel), which finds Carol leaving Earth for a year to go find herself and also establish an Avengers outpost in space. Oh, and she kind of teams up with the Guardians of the Galaxy a little bit and there's romance and all good stuff. So for those of you who don't hang off of every word that comes out of the mouth of the guy at the comic book shop down the corner, Carol Danvers was an air force pilot who ended up with alien powers (the accounts of how she ended up with alien powers, like all origin stories in comics, vary a lot), and she took up superheroing like you do. Her powers were vaguely related to those of Mar Vell**, the original Captain Marvel, so she took the name Ms. Marvel. And then later changed it to Binary. And then Warbird. And finally she just said screw it and was Captain Marvel herself. This is a totally accurate and by no means abridged accounting of the facts. Again, like most comic book characters, her story and her character have shifted a lot over the years, so let's just talk about this most recent incarnation - the Captain Marvel of the 2014 standalone series. What's her deal? Well, she's strong, physically and emotionally, she's kind, even going so far as to let people crash at her place (which is in the Statue of Liberty and that's just cool), and she likes her cat. Like she likes her cat a lot more than I think I have ever liked any of my pets, and I really do love animals. Not super important, but, as it turns out, a plot point. Oh! And she's secretly dating Colonel James Rhodes (Rhodey), aka Iron Patriot, aka War Machine. These guys need to stop changing their names. Underneath all of that, however, Carol is also something else: restless. She's been living the life she knows she's meant for, but she still feels like her feet are getting itchy. Like there's something more she could have or do. Like she's not done yet, not ready to settle down. And so, when Tony Stark comes to her with the idea of an Avengers outpost in space, she jumps at the chance. Which is how we get our current story. Carol Danvers, in a ship Tony Stark built, exploring space on her own, kind of missing the people back home, but honestly just glad to be out there, living. And she took her cat with her. Like I said, she's way more attached than I've ever been. But also her cat is kind of a jerk and none of her friends would take care of it while she was gone. Since she's an Avenger in space, she obviously gets into trouble, and has some run ins with the Guardians of the Galaxy. The comic run is only two issues deep so far, so I don't know where all of this is going, but I can guess. And guessing is the fun part. But before we get to the wild speculation part of our program, I do want to say that this run really cements for me the awesomeness of the diversity of female characters in the Marvel comic universe. I mean, partially the racial diversity (though not so much, sadly), but more the emotional diversity. Carol Danvers is good at her job, loves saving people, but she's not satisfied. And more than that, she's never told that she should be. When Tony comes to her with the idea and Carol leaps at the chance to go off on an adventure by herself, he doesn't tell her, "Whoa now! Slow down. You're dating my best friend. You don't get to abandon him like this." I mean, partly that could be because he doesn't officially know (Or does he? I forget. ), but I think the real motivation here is that Tony doesn't really see anything wrong with Carol still needing to find herself. And when she talks to Rhodey about it too, he's disappointed, yes, but he understands. In fact, his exact line to her, "I will be many things for you, Carol Danvers... but I'm never gonna be the one that holds you down." That is right up there on my list of super romantic things that I would very much like someone to say to me someday. I'm okay with them calling me Carol Danvers too, for the record. It's not just romantic, though, it's important. What Rhodey is saying there is that he recognizes that Carol's need to find herself is legitimate. It's not just a whiny woman thing or her needing to settle down and accept the life she has. He sees that she's restless, and he tells her to go. He validates her need, and sets her free. Why the hell are there not more awesome love interests like that? Seriously. Rhodey for the win. Upshot of this is that there are so many different ways to be a female character, and just as many ways to be a strong one. It doesn't make Carol weak that she's dissatisfied with her life, nor would it make her any weaker if she was perfectly content. Neither of those things is bad in and of themselves. What makes me love Carol is her decisiveness. She knows she's restless, and she knows that she's looking for a place she fits on Earth. So she decides to go find herself. She doesn't waffle, she doesn't hesitate, she just goes. And it's good. Now on to the blatant speculation part of the program. Yay! So, as some of you probably know, there have been rumors circulating for the longest time that Marvel is going to finally give in and make a Captain Marvel movie, and it does make sense. Captain Marvel is one of their most recognizable titles, male or female, and certainly a hell of a lot better known than Guardians of the Galaxy or Ant-Man at this point in time. Plus, Carol is an awesome character, and the MCU really needs to just bite the bullet and make a female lead movie already. Well, this new comic run is giving me an idea that they might actually do it after all. How? Because of one simple thing: Captain Marvel is in space right now. Marvel loves space. 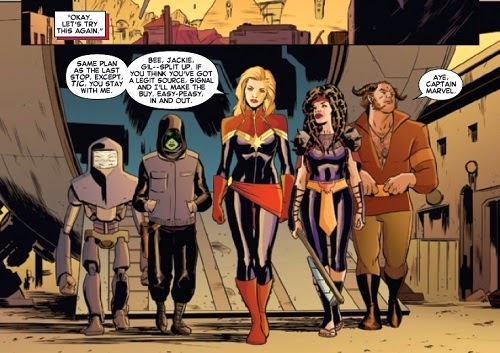 More specifically, Captain Marvel is right now, in the comics, doing a special run where she adventures in space, occasionally teaming up with the Guardians of the Galaxy, like I said, who are in the comic right now in the exact same configuration that they will be in the movie this summer. I mention this because that's not always true. The Guardians of the Galaxy, like most superhero teams, has a pretty fluid membership, so it's clearly part of a promotional twist that the current roster is exactly the same is the one in the movie. 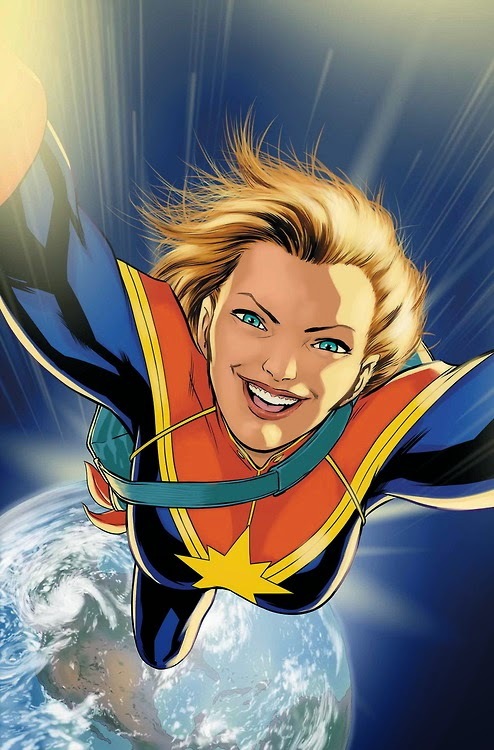 Captain Marvel is in space, working with the Guardians of the Galaxy, but she's also an Avenger back on Earth, and she has strong relational ties to Iron Man and Iron Patriot, as well as pretty much everyone else in the movies. What that means is that Captain Marvel is perfectly situated to act as the go-between, linking up the storyline in outer space that we will see in this summer's Guardians of the Galaxy with the chaos that's happening on Earth in Marvel's Phase 3, and probably culminating in Avengers 3. Because we know, we know, that it's not unrelated. There's no way. Marvel doesn't do unrelated stories. In all the franchises they own together, they freaking love bringing the pieces into line. So at the end of Thor: The Dark World, we see a terrifying artifact being entrusted to The Collector (Benicio del Toro), and then we see that same Collector in the preview for Guardians of the Galaxy. We know that the second Avengers movie isn't about the artifacts, because it's Age of Ultron. And since Marvel never does anything by accident, that leaves open the probability that they will be a key point in the third movie. And that, dear readers, means that the Guardians of the Galaxy will need some connection to our friends on Earth. True, they could just show up and say hi, but they probably won't. It's not Marvel's style. Remember that up to the Avengers, all the storylines were being connected by Agent Coulson. So now we're going to have something else tying them together. Something blonde and restless named Carol. That's just my speculation, but I think it's got good odds. At the very least, I would be shocked if she doesn't turn up eventually in one of these films, even as a passing mention. She's too big a name not to. But I really do think they could do a full feature of her, and since now she's in space, in ground that the MCU seems keen to break, I think there are solid chances that Captain Marvel will play a big role in Marvel's Phase 3. She'd better. All I'm saying. *For the longest time I clung to the Marvel Movie Universe as the official title of this (MMU), but it seems like I've been overruled and we're going with Marvel Cinematic Universe instead (MCU). Laaaaame. Plus, Carol is an awesome character, and the MCU really needs to just bite the bullet and make a female lead movie already. Two. Captain Marvel and Black Widow. Female ensemble cast. Love it! That conversation with Rhodey and then she asks him to watch her cat... loved that. I have had that conversation. DeConnick writes Carol as very spunky but still mature, in over her head but competent.. it's really perfect. And Marvel comic series are starting to really tie into their cinematic and TV representations more and more. I like the cohesion, it's good for attracting newer fans who might be more but off my alternate versions of characters they only see in films. It takes out some of the snobbery. I dig it. I find it really heartening that Marvel has quietly restarted a bunch of their titles so that they're more easily accessible. Like starting off whole new runs of Captain Marvel and Black Widow and Ms. Marvel and She-Hulk (even if She-Hulk is deeply disappointing right now). I appreciate that they're trying to make it easy for new fans to get into it. Ah, a company that gets it! What that means is that Captain Marvel is perfectly situated to act as the go-between, linking up the storyline in outer space that we will see in this summer's Guardians of the Galaxy with the chaos that's happening on Earth in Marvel's Phase 3, and probably culminating in Avengers 3. People on other forums have said that the blue alien glimpsed in Agents of SHIELD is consistent with being a Kree (that's beyond the scope of my knowledge), but since Hydra's Deluxe Sinister Experiments seem to be being employed as a source of superpowers in cases like the twins, then maybe this is an origin for Carol. Like that facility being raided, because of secrets Nat has dumped on the net, and something going weird. And taking that alien home would be a good hook for Carol heading into space. And staying because, well, it's space. I know they mentioned the possibility that the AoS alien is a Kree - I kind of hope so too. Good storylines that way. Plus, Carol taking that alien home would fit in really well with the storyline already established, where she's going into space to take Tic home. I love it when the whole thing fits together.